Look for uniform shape. Look for a firm, symmetrical watermelon free from bruises, cuts or dents. If the watermelon has any lumps or bumps, this may mean that it received irregular amounts of sunshine or water during growing. Lift it up. 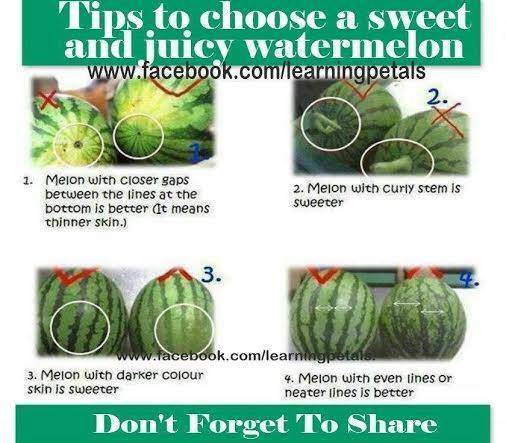 The watermelon should be heavy for its size, as this indicates that it is full of water and therefore nice and ripe. Try comparing the weight of your watermelon with another of equal size – the heavier one will be the ripest. This advice goes for most fruit and vegetables. Look for the field spot. The underside of the watermelon should have a creamy yellow spot, known as the field spot. This is where the melon sat on the ground and ripened in the sun, so the darker it is the better. If the field spot is white, or even nonexistent, this probably means that the watermelon was picked too soon, and will not be ripe. Inspect the color. A perfect, ripe watermelon should be dark green in color and dull in appearance, rather than shiny. A shiny watermelon will usually be underripe. Try the knocking technique. The knocking technique can be a little hard to master, but many watermelon fans swear by it. Give the watermelon a firm rap with your knuckles and listen to the sound it makes. For a ripe melon, you want a full sound, more tenor than base. You do not want a dull or deep sound, as this means the watermelon is unripe. Take a look at the bin, shelf, or box the cantaloupes are being stored in. If there are flies or other insects around it, or there is juice leaking out and covering the fruits, it’s probably a good idea to buy your melon elsewhere. To pick a cantaloupe, look for a fruit that is light tan with green lines across it. Avoid melons with punctures, dents, or large brown or black patches. Pick up the cantaloupe. It should be heavy for its size, and firm but not rock hard. A cantaloupe that is still a little hard is good for if you are buying for an event about a week away, but if you are planning on taking your cantaloupe home and eating then and there, you’ll want one that has a little give. Smell. Sniff the spot where the melon was severed from its stem. You should smell an aroma similar to a freshly sliced cantaloupe. If you can’t smell anything, it’s under ripe. An unpleasing smell means it’s no longer good to eat. Listen. Shake the cantaloupe next to your ear. If you can hear seed rattling about inside, it’s ready to eat. Touch and feel around the entire mango. Ripe mangoes will be slightly soft to the touch just like avocados and peaches, but not soft or mushy enough to where your fingers sink into or through the skin. On the other hand, if you do not plan on eating the mango for a few days, you may want to choose a mango with firmer skin. Inspect the mango visually. Choose mangoes that are full, plump and round, especially around the stem because they will be the ripest and of the best quality. Choosing mangoes shaped as footballs are also ideal. Sometimes ripe mangoes will have brown spots or speckles; this is normal. Do not pick flat or thin mangoes because they are likely to be stringy. Avoid choosing mangoes with wrinkled or shriveled skin because they will no longer be ripe. Smell mangoes near their stems. Ripe mangoes will always have a strong, sweet, fragrant and fruity aroma around the stem. Stay away from mangoes that smell sour or like alcohol because these mangoes may be overripe. Since mangoes have a high natural sugar content, they will ferment naturally, so the sour, alcoholic odor is a distinctive sign the mango is no longer ripe. Disregard the color of mangoes. Since the colors of ripe mangoes can range from yellow, to green, pink, and red depending on the variety and season, do not rely on color alone to determine the ripeness of a mango. Instead, familiarize yourself with the different varieties of mangoes and the seasons in which they thrive. Learn about the varieties of different mangoes. Since mangoes have different colors and slightly different flavors depending on the current season and the region they come from, you may want to learn how to identify certain types of mangoes to heighten your overall experience with them. There are 6 different types of mangoes. Pick Ataulfo mangoes for a sweet and creamy flavor. Ataulfos have smaller seeds and more flesh. They are vibrant yellow and are small and shaped like an oval. Ataulfos are ripe when their skin turns deep gold and may develop small wrinkles when they are fully ripe. Ataulfos come from Mexico and are usually available from March through July. Pick Francis mangoes if you like rich, spicy and sweet flavors. Francis mangoes have bright yellow skin with green overtones and are usually oblong or shaped like the letter S. Francis mangoes are ripe when their green overtones fade away and the yellow hues become more golden. Francis mangoes are grown on small farms throughout Haiti and are usually available from May through July. Choose Haden mangoes for rich flavor with aromatic overtones. Haden mangoes are bright red with green and yellow overtones and small white dots. Haden mangoes are usually medium or large with oval or round shapes. Haden mangoes are ripe when the green overtones begin changing to yellow. Haden mangoes are from Mexico and are only available during April and May. Pick Keitt mangoes for a sweet, fruity flavor. Keitts are oval-shaped and medium to dark green with a pink blush. The skin of Keitt mangoes will remain green even when they are ripe. Keitt mangoes are grown in both Mexico and the United States and are usually available in August and September. Choose Kent mangoes for a sweet and rich flavor. Kent mangoes come in large, oval shapes and are dark green with a dark red blush. Kent mangoes are ripe when yellow overtones or dots begin to spread over the skin of the mango. Kent mangoes come from Mexico, Peru, and Ecuador and are available from January to March and June to August. Pick Tommy Atkins mangoes for a mild and sweet flavor. Tommy Atkins mangoes will have a dark red blush with some green, orange, and yellow accents and are oblong or oval-shaped. The only way to test the ripeness of Tommy Atkins mangoes are to feel them, since their color will not change. Tommy Atkins mangoes are grown in Mexico and other regions in South America and are available from March to July and from October to January.